I’ve recently had some new business cards and other stationery printed by moo – I love that I can have as many different designs as I like in one pack, although I don’t often use that option! Anyway whilst I was randomly wandering around their site the other day I found a wonderful section showcasing things that other people had done for their Wedding. Breaking the ice at the wedding reception is always hard – how DO you get people to talk to each other? 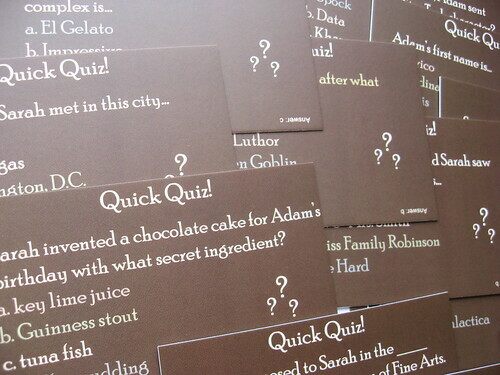 I’ve talked about ‘I Spy’ Photo games here before, but what about a quiz asking questions about the happy couple? There’s nothing like competition to get people chatting! 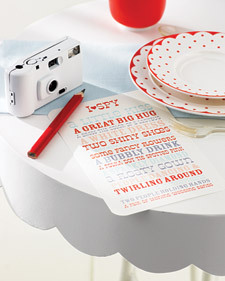 I Spy Photo Game at your Wedding! I love this idea! Give your littlest guests something to do at the wedding reception. Provide a disposable camera and a list of things for them to photograph – use pictures instead of words if you have very young children or make up your own poem of things to ‘click’. Below are a couple of links to get your juices flowing! Why save it just for the kids, that’s what I say? Get everyone involved, I guarantee they’ll all have fun. Add a photosharing website address and password details and have your guests upload their photos after the wedding. You can never have enough photos of the big day!